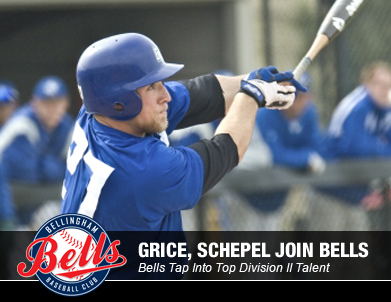 For the first time in team history the Bellingham Bells have signed a pair of players from Division II Grand Valley State University (GVSU) in Allendale, Mich., as the West Coast League ballclub announced the additions of outfield Cody Grice and right-handed pitcher Kyle Schepel. 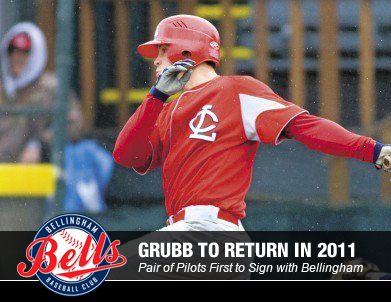 A pair of University of Portland Pilots have become the first players to sign with the Bellingham Bells for the 2011 West Coast League season as the club announced the return of catch Ben Grubb and the addition of pitcher J.R. Bunda. The Bellingham Bells have named Blake Buswell their new general manager. 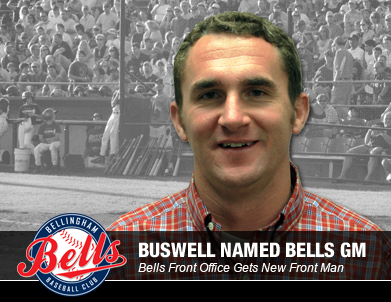 Buswell, who joins the Bells’ front office after working for the Reno (Nev.) Aces of the Triple-A Pacific Coast League, brings a wealth of experience in the industry with more than six years in minor league baseball. 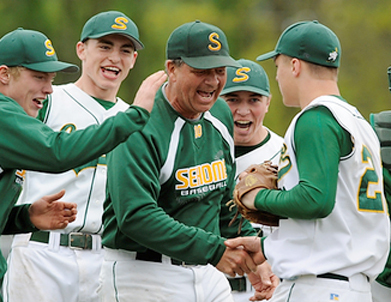 Longtime Sehome High School head baseball coach and Washington State Baseball Coaches Hall of Famer Gary Hatch has been named the new head coach of the Bellingham Bells replacing Kevin Matthews, who resigned after the 2010 season to pursue interests outside of baseball. The Blue Jays sent Marc Rzepczynski to Arizona to get in some more work this fall. 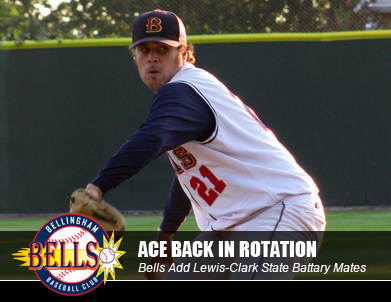 And at the age of 25, the former Bells left-hander is one of the senior members of the Peoria Javelinas' clubhouse. The Bellingham Bells will open their West Coast League baseball season June 3 at Joe Martin Field in the first of three consecutive games against the Kelowna Falcons. 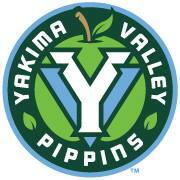 The 2011 season will be the Bells’ 13th since reforming in 1999 and Bellingham’s seventh as an original member of the WCL. The Bellingham Bells Baseball Club of the West Coast League have a new owner as Bellevue businessman Eddie Poplawski has purchased the franchise from Brett Sports & Entertainment, who have owned the team since January 2008. 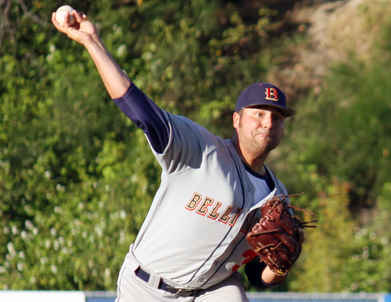 Bellingham Bells starter and UCLA right-hander Scott Griggs has been tabbed the No. 4 prospect in the West Coast League by Baseball America, as announced by the national magazine this week in its annual rankings of top summer collegiate baseball league prospects. Former Bellingham Bells pitcher Stephen Fife was named pitcher of the week for hits efforts at Double-A Portland for the week ending in Sept. 5. 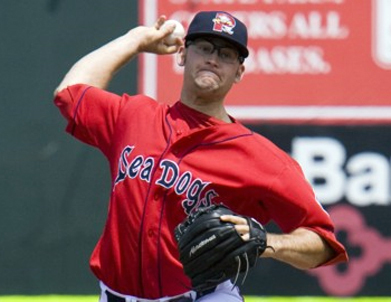 It's been an up-and-down year for Red Sox prospect. He's had 25 starts in which he allowed two or fewer runs and seven others in which he allowed five or more runs. Fife's two starts last week definitely fell into the former category. 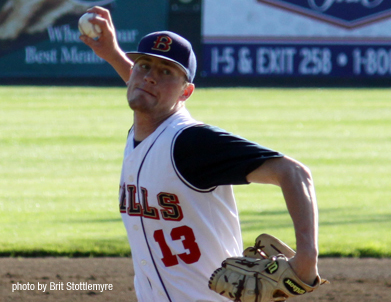 Against Binghamton, Fife tossed six innings of shutout ball, allowing just two hits and fanning five. He didn't allow a hit until there was one out in the sixth inning. Fife was only slightly less effective, allowing two runs in five innings of another Portland win, this one over playoff-bound New Hampshire. 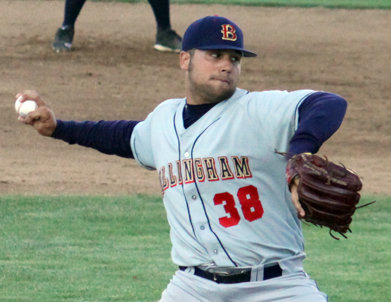 Bellingham Bells starting pitcher Cody Fassold was selected to the All-West Coast League First Team after going 4-1 with a 1.75 ERA during the 2010 season. WCL President Ken Wilson announced the All-WCL teams Monday, August 30, following a league-wide vote by head coaches. The Bellingham Bells won their sixth straight West Coast League game Friday, Aug. 6, as the league’s hottest team down the home stretch defeated the Kitsap BlueJackets 5-1 at Joe Martin Field. The Bellingham Bells returned home in a big way Wednesday, Aug. 4, by shutting out the Portland Toros 13-0 in non-league action at Joe Martin Field. 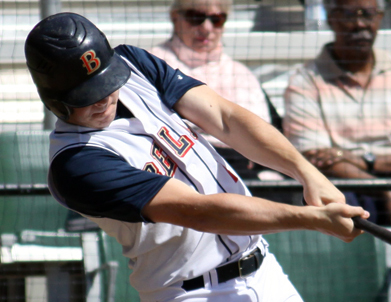 The win completed a four-game season sweep of WCL Portland clubs for the Bells. Travis Anderson’s four-hit day helped the Bellingham Bells complete their series sweep of the Walla Walla Sweets on Sunday, Aug. 1 in West Coast League action. 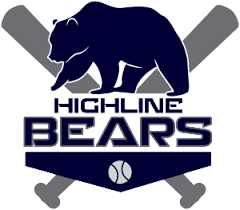 The 10-6 victory was Bellingham’s fifth straight and secured the franchises first winning season since joining the WCL. Anderson started off his day with a run-scoring single in the second inning to give Bellingham the early lead. One inning later, Anderson hit a sacrifice fly to center field to plate Brady Locker from third base. Anderson’s day continued with a leadoff single in the sixth inning, a three-run home run in the seventh and another single in the eighth. He finished the game with four hits in four at-bats with two runs scored and 5 RBI. But Anderson was not alone at the plate as the Bells collected 14 more hits for a three-game series total of 40 hits against the Sweets. 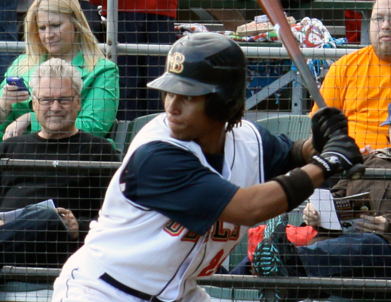 In addition to Anderson’s four-hit performance, Junnior Dishmey-Perez had three hits while Locker, Ben Grubb, and Chris Sturdivant each had two hits. The Bells only gave up five hits in the game, as Scott Griggs, Mitch Ludtke, and John Volk combined to pitch Bellingham to the series sweep. 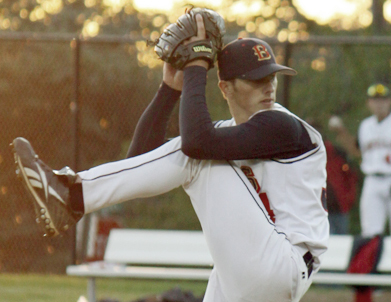 Griggs tossed 4 2/3 innings in which he struck out seven batters and allowed five runs—four earned. 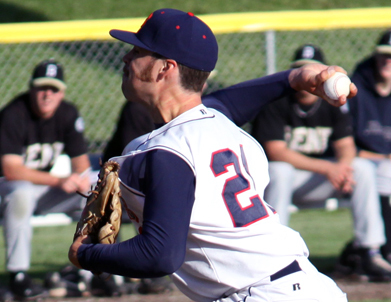 He gave way to Ludtke, who picked up the win after throwing 3 1/3 innings of two-hit, one-run baseball. Volk finished the game by striking out three batters in the ninth inning. 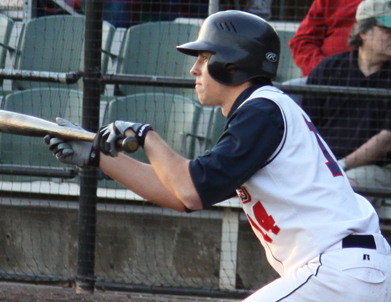 Bellingham finished the road portion of its 2010 season with a 13-11 record. The Bells now have two off days before returning to action on Wednesday, Aug. 4 against Portland at Joe Martin Field. 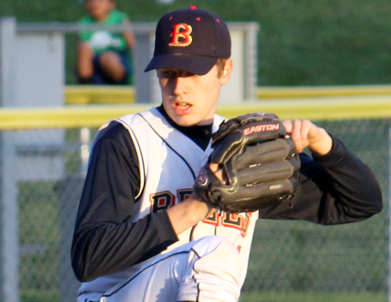 Bellingham wraps up the 2010 regular season with a pair of games against the Kitsap BlueJackets on Friday (Aug. 6) and Saturday (Aug. 7). Game time for Bellingham’s remaining three home games is set for 6:35 p.m. with fireworks scheduled to follow Saturday’s season finale. 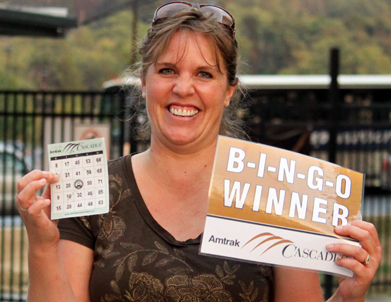 For more information about getting tickets to any of Bellingham’s final three regular season games, contact the Bells Ticket Office at 527-1035 or visit www.BellinghamBells.com. The Bellingham Bells sets a single-season franchise record for wins since joining the West Coast League in 2005 with Saturday’s 5-4 victory over the Walla Walla Sweets at Borleske Stadium. The win was Bellingham’s third consecutive victory and moved the Bells above the .500 mark for the first time since July 24. 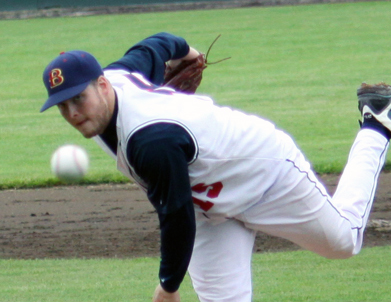 Cody Fassold pitched seven shutout innings Friday, July 30, as the Bellingham Bells won their record-tying 22nd game of the season 9-0 over the Walla Walla Sweets in West Coast League action. 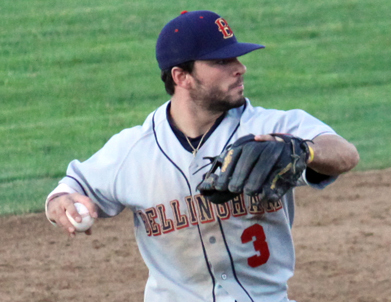 Ben Ruff did everything he could on Thursday, July 29, to give the Bellingham Bells their second straight victory. He only had one hit on the night, but the Bells two-way player helped plate the game-winning run as he reached on an error in the ninth inning and struck out five in the final two innings to give Bellingham the 4-3 victory over the Moses Lake Pirates. The Bellingham Bells outlasted the Moses Lake Pirates 10-7 Wednesday, July 28, at Moses Lake in West Coast League action as the teams combined for 26 hits. Charlie Markson was 2 for 4 with two runs, Brady Locker was 3 for 5 with three runs, an RBI and a triple, Travis Anderson was 2 for 4 with two runs and an RBI and Mike Chiarelli was 2 for 5 with two RBI and a double. The Bellingham Bells were shut out at Joe Martin Field on Monday, July 26, as the Corvallis Knights dominated offensively with 11 hits and held the Bells to just four hits in West Coast League action at Joe Martin Field. The Bellingham Bells were 90 feet away from pulling even with the Wenatchee Applesox on Thursday, July 22, before the visiting squad turned a double play to seal the win in Bellingham�s 2-1 loss in West Coast League action. Behind six solid innings from starter Scott Griggs, the Bellingham Bells won their third consecutive game with Tuesday�s 9-3 win over the Portland Ports at Joe Martin Field. 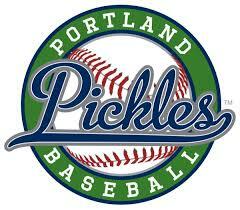 For the second night in a row it was a fourth-inning home run by the Bellingham Bells that broke a scoreless tie as Bellingham�s Chris Pierce sent a ball over the left field wall to put the Bells ahead en route to Saturday�s 7-3 win over the Portland Bucks. Brady Locker hit a solo home run to lead off the fourth inning and the Bellingham Bells never looked back en route to Friday’s 5-0 shutout of the Portland Buck in non-league action at Joe Martin Field. Wednesday was everything but the beautiful sunny day that is actually was for the Bellingham Bells as the Bells were shut out 2-0 in the series finale against the visiting Cowlitz Black Bears. The Bellingham Bells loaded the bases down one run in the bottom of the ninth but were unable to score, losing the second game of the three game series to the Cowlitz Black Bears 6-5 in West Coast League action. The Bellingham Bells returned home after a nine-game road trip in winning fashion by taking down the Cowlitz Black Bears 4-3 in West Coast League action at Joe Martin Field on Monday, July 12. After taking the first game of the series on Friday, the Bellingham Bells have dropped two straight to the Bend Elks including Sunday’s 6-1 loss at Vince Genna Stadium. The Bellingham Bells scored four runs in the ninth inning but the rally ultimately fell short after falling far behind early in Saturday’s 9-6 loss to the Bend Elks at Vince Genna Stadium. The two best teams in the West Coast League opened a three-game series Friday, July 9 at Vince Genna Stadium in Bend, Ore., with the Bellingham Bells taking game one 7-5 over the Bend Elks. The Bellingham Bells fell behind 1-0 in the first inning to the Kitsap BlueJackets and never got back in the game, losing 12-0 in the final game of a three-game series at the Kitsap Fairgrounds in Bremerton, Wash.
James Wise and Andy Seaman combined to strike out 11 Kitsap batters Wednesday, July 7 but the Bellingham Bells managed just six hits and suffered from two errors as the BlueJackets earned the 3-2 win at the Kitsap Fairgrounds. The Bellingham Bells took over sole possession of second place in the West Coast League’s West Division on Monday, July 5 with a 6-2 win over the Corvallis Knights at Goss Stadium. 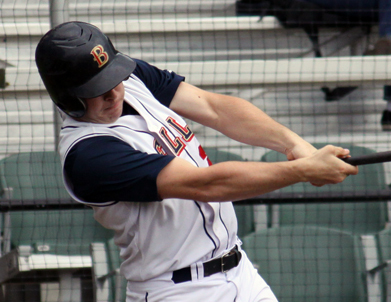 The Bellingham Bells benefited from two late singles off the bat of Charlie Markson as the Bells� left fielder drove in one run in the eighth inning and two in the ninth to give Bellingham a 9-6 win over the Corvallis Knights at Goss Stadium on Sunday, July 4. The Bellingham Bells managed just three hits and suffered from two errors as they opened a nine game West Coast League road trip with a 4-1 loss at the hands of the Corvallis Knights at Goss Stadium in Corvallis, Ore.
James Wise pitched eight strong innings and led the Bellingham Bells to a 5-1 West Coast League victory over Kitsap on Friday, July 2, at Joe Martin Field. Wise pitched eight innings and gave up one run on four hits and had eight strikeouts to earn the victory. 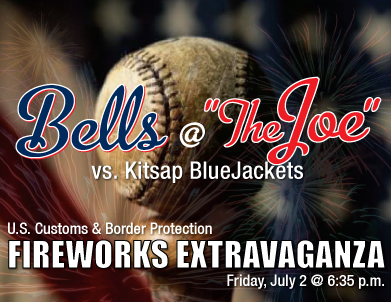 The first fireworks show in Bellingham to celebrate Independence Day is set to follow the Bellingham Bells’ baseball game at Joe Martin Field on Friday, July 2, against the Kitsap BlueJackets. U.S. Customs and Border Protection are sponsoring the game and post-game fireworks extravaganza, with a full night of family-fun and entertainment set to begin when the gates open at 6:00 p.m. The Bellingham Bells were held scoreless by Walla Walla’s Ryan Richardson through the first eight innings of Wednesday afternoon’s Banner Bank Day Game, then the flood gates opened as Brady Locker hit a three-run, game-ending home run in the bottom of the ninth to give Bellingham the 5-2 victory that clinched the series. 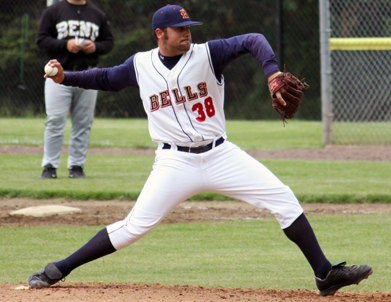 Cordell Greene pitched eight innings of five-hit baseball Tuesday, June 29 as the Bellingham Bells evened their series with the Walla Walla Sweets at Joe Martin Field with a 5-2 victory. The Bellingham Bells lost their second consecutive game Monday, June 28 at Joe Martin Field in their first game ever against one of the newest West Coast League teams, the Walla Walla Sweets. Bellingham Bells starter Cody Fassold has been named the West Coast League player of the week, league officials announced Tuesday, after shutting out Moses Lake on Friday, June 25, en route to his second win of the season. The Bellingham Bells made it four straight Saturday, June 26 with a 8-7 victory over the Moses Lake Pirates in West Coast League action at Joe Martin Field. The Bells returned home in triumphant fashion Friday, June 25 after a 10-game road trip with a 3-0 victory over the Moses Lake Pirates at Joe Martin Field. The Bellingham Bells wrapped up their 10-game road trip with a 5-4 win over the Kelowna Falcons Wednesday, June 23, at Elks Stadium in Kelowna, B.C. Trailing 4-0, the Bells used a four-run sixth inning to tie the game before catcher Jeff Calhoon drove in the game-winning run with his lone hit of the contest in the eighth inning. 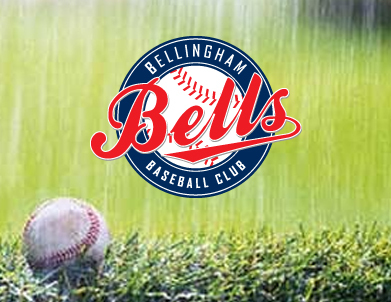 The Bellingham Bells and Post 7 have canceled their game originally scheduled for Thursday, June 24, at Joe Martin Field. The game had to be canceled after scheduling conflicts were discovered by the Legion club. 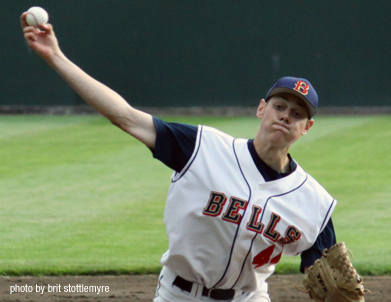 It took three starts, but the ace of the Bellingham Bells pitching staff Tyrell Poggemeyer finally notched one in the win column Tuesday, June 22, as the Bells moved their record 9-9 with a 3-1 victory over the Kelowna Falcons at Elks Stadium. Making up a rained out game from opening weekend in Bellingham, the Kelowna Falcons and Bellingham Bells met for a pair of games Monday, June 21, at Elks Stadium. James Wise took the mound for Bellingham in game one and threw a complete game shutout at the Bells picked up a 5-0 win—Bellingham later fell in game two 1-0. 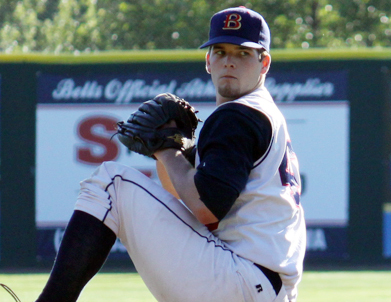 Cody Fassold struck out 12 Saturday, June 19, to pace the way for Bellingham as the Bells snapped a three-game losing streak with a 9-2 victory over the Wenatchee Applesox at Paul Thomas Sr. Field. 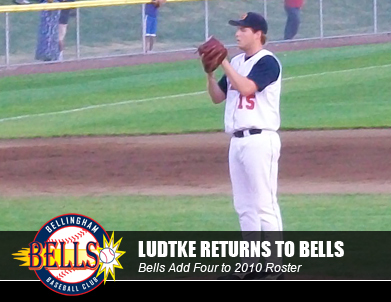 The Bellingham Bells scored twice in the top of the ninth inning to pull even with the Applesox, but relief pitcher Mitch Ludtke gave up a walk off single to former Bells infielder Trent Bridges as Wenatchee took the series opener 3-2 Friday, June 18, at Paul Thomas Sr. Field. 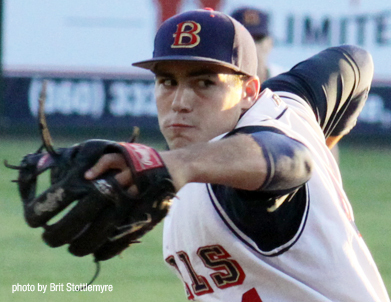 Another quiet night at the plate for Bellingham kept the Bells off the scoreboard as the Cowlitz Black Bears shut out the Bells Thursday, June 15, 5-0 at Story Field in Longview, Wash. In their first road test of the 2010 season, the Bellingham Bells scored all five of their runs in a 5-4 victory over the Cowlitz Black Bears on balls that left Story Field in Longview, Wash., Tuesday. Kawika Emsley-Pai was a Day 2 draft pick; Beau Brett went on Day 3. Now Emsley-Pai and Brett are gearing up to make their professional debuts after officially signing deals with the Arizona Diamondbacks organization and the Los Angeles Dodgers organization, respectively. Sunday’s game marked the third time in the last four games that the Bellingham Bells went into extra innings and this time they came out on top, 2-1, over the Bend Elks at Joe Martin Field to snap a two-game losing streak and improve to 4-3 on the young West Coast League season. For the first time of the young 2010 season, the Bellingham Bells dropped their second consecutive game to the Bend Elks, 4-3. The Bells battled all the way through the bottom of the ninth, but early runs surrendered in the first and second innings were too much for the home team to overcome. The Bellingham Bells had two base runners on in the bottom of the 10th inning but couldn't push across any runs as they lost 3-2 to Bend in the opener of a three-game set Friday, June 11, at Joe Martin Field. After picking up the win in Monday’s 12-inning contest, the Bellingham Bells’ Ben Ruff suited up as the designated hitter Tuesday and finished with three hits in three at bats to pace the way in Bellingham’s 15-2 drubbing of Corvallis. Catcher Kawika Emsley-Pai of the Bellingham Bells has show great patience drawing four walks in just three games with the club. He didn’t need much patience Tuesday as his name was called by the Arizona Diamondbacks in the 10th round of Major League Baseball’s 2010 First-Year Player Draft. The Bellingham Bells fought off the surging Corvallis Knights throughout Monday’s 12-inning affair to take the opening game of the three-game series 3-1. Steady rain over Bellingham has forced the Bells to postpone Sunday’s series finale against the Kelowna Falcons. The game will be made at a later date that has not yet been determined. The Bellingham Bells redeemed themselves after giving away opening night with a 5-3 victory Saturday against the visiting Kelowna Falcons. 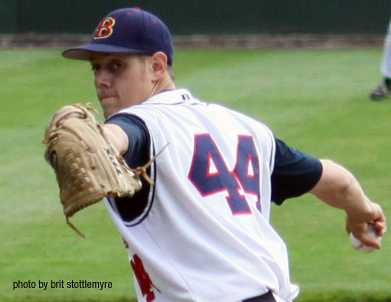 Cordell Greene threw seven shutout innings on Saturday night at Joe Martin Field and the Bells evened the series. 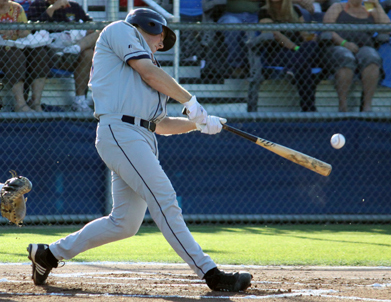 The Bellingham Bells fell in the 2010 season opener at Joe Martin Field on Friday. 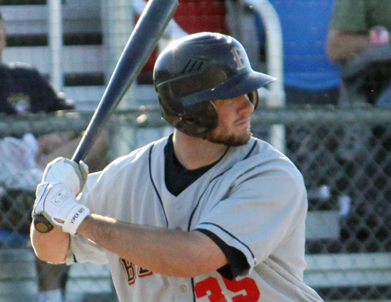 After a solid showing through the first six frames, the Bells gave up a seventh inning scoring spree to the Kelowna Falcons as the home team suffered the 10-7 loss. 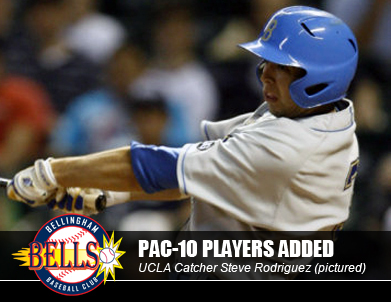 The Bellingham Bells are close to finishing off their 2010 roster with opening night just 10 days away. 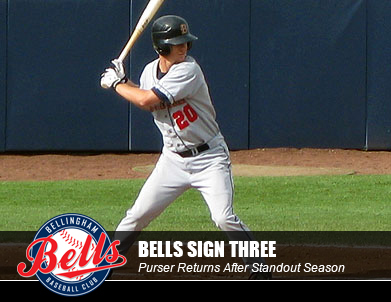 On Tuesday (May 25), the Bells announced the additions of pitcher Cordell Greene, infielder Cody Regis, and outfielder/pitcher Mark Purser. 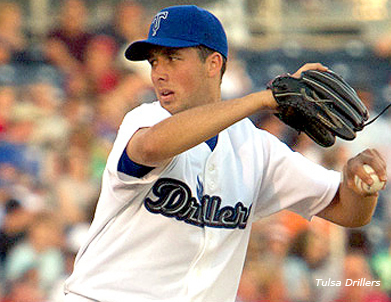 Colorado Rockies starter and former Bellingham Bells pitcher Jeff Francis made his second and potentially final rehab start for Double-A Tulsa on Tuesday afternoon, allowing six hits over seven shutout innings in the Drillers' 4-1 loss to Northwest Arkansas. 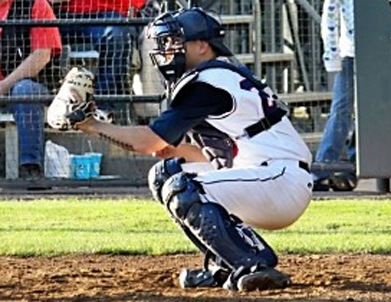 One of the best pitchers in the West Coast League during the 2009 season is returning to Bellingham this summer and he’s bringing his own catcher. 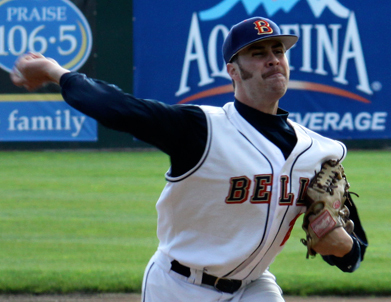 Bells ace and former Oregon State pitcher Tyrell Poggemeyer will be back in a Bells uniform in 2010 and was instrumental in recruiting Kawika Emsley-Pai, a member of the Texas Longhorns 2008 Big 12 Tournament Championship squad. With the Bells Opening Day around the corner, our very own "Boys of Summer" will arrive in Bellingham soon. 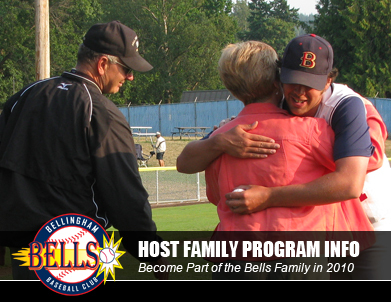 To prepare for their arrival, the Bellingham Bells are now seeking Host Families for the 2010 season. 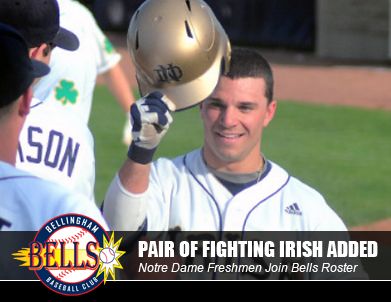 The Bellingham Bells have added a pair of Notre Dame freshmen to the 2010 roster with second-baseman Frank Desico (pictured) and outfielder Charlie Markson signing with the West Coast League team. The Bellingham Bells added two outfielders and two pitchers to their 2010 roster Thursday, April 8, with the additions of Wynton Bernard, Chris Sturdivant, Mitch Ludtke, and John Volk. The announcement brings Bellingham’s roster to 17 players with 57 days remaining before the Bells embark on their 12th season—the Bells full roster will be comprised to 26 players. 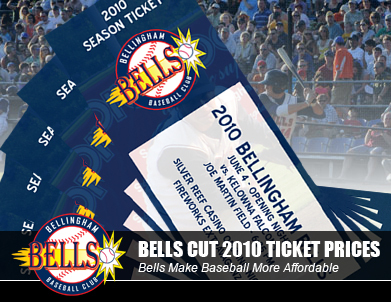 Each year the Bellingham Bells strive to provide their fans with affordable entertainment in a family-friendly atmosphere—the 2010 season will be no different. 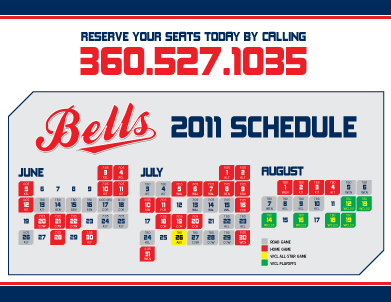 For the upcoming 2010 season, the Bells have cut ticket prices in an effort to pass the savings on to their fans. The Bellingham Bells have added five players to their roster from one of the best collegiate baseball conferences in the country. Pac-10 players Steve Rodriguez, Scott Griggs, and Chase Brewer from UCLA, Tony Bryant from Oregon State, and James Wise from Washington State will all suit up for the Bells as they kick off their 12th season this summer. 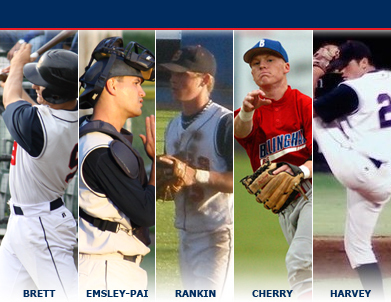 Five familiar faces are back on the roster for the Bellingham Bells. 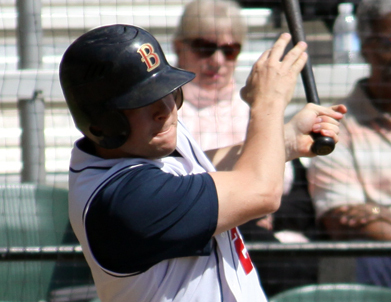 The West Coast League ballclub announced Thursday that it has re-signed Beau Brett, Mike Chiarelli, Danny Hennigs, Brady Locker, and Sam Richter for the 2010 season. 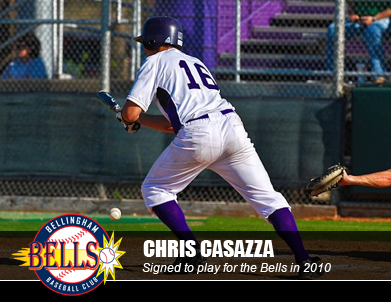 The Bellingham Bells of the West Coast League have added Tarleton State University juniors Chris Casazza and Junnior Dishmey-Perez to the 2010 roster. 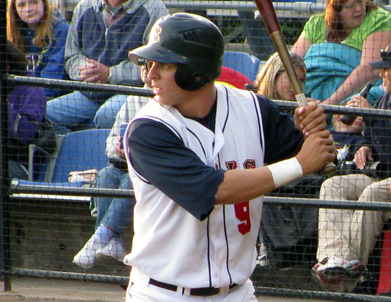 Casazza played third base a member of the WCL’s Moses Lake Pirates in 2009 where he led the league in home runs (9) and total bases (79). 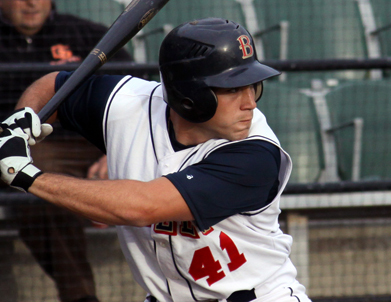 The Temecula, Calif., native finished the 2009 WCL season with eight doubles, 22 runs batted in, and 31 runs scored on his way to being named the league’s ninth best prospect by Baseball America. As a sophomore at Tarleton State, Casazza hit for a .354 average in 50 games in 2009 before joining the Pirates. He was named Second Team All-Lone Star Conference after leading his team in hits (63), triples (5), home runs (12), runs batted in (53), and slugging percentage (.705). Dishmey-Perez is in his first year at Tarleton State after transferring from Cisco Junior College. 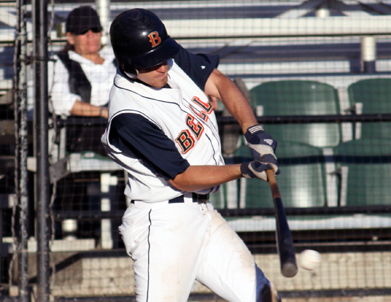 In 2009, Dishmey-Perez was named First Team All-Conference as a second baseman. He played for the Lehigh Valley Catz of the Atlantic Collegiate Baseball League during the summer of 2009 where he led his team with a .346 batting average. The Santo Domingo, Dominican Republic, native finished second in the ACBL with 11 doubles and also recorded a pair of triples, two home runs and 19 runs batted in. “Chris and Junnior are going to provide us with some great experience both offensively and defensively,” said Bells general manager Justin Stottlemyre. “We saw first-hand what Chris has the capability of doing at the plate in this league and hope another year will only make him a stronger all-around player. The Bellingham Bells kick off their 12th season June 4, 2010 at Joe Martin Field against the Kelowna Falcons. Great group and single-game tickets are still available for the 2010 season by calling the Bells Ticket Office at 360-746-0406. 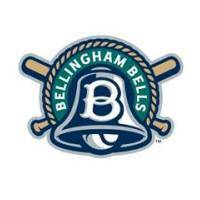 The Bellingham Bells are a professionally operated collegiate summer baseball team in the West Coast League. The team is owned and operated by Brett Sports & Entertainment which includes Major League Baseball Hall of Famer George Brett and Brett Sports managing partner Bobby Brett. The Bellingham Bells strive to provide their fans, sponsors, and partners with the very best in competitive baseball and affordable entertainment in a family-friendly atmosphere. 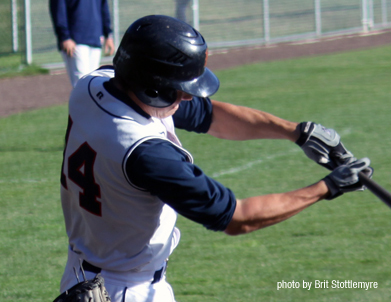 The team is comprised of college baseball players from across the country. In recent years, the Bells have produced a number of Major League products including Jeff Francis of the 2007 National League Champion Colorado Rockies and Whatcom County natives Ty Taubenheim and Kevin Richardson. 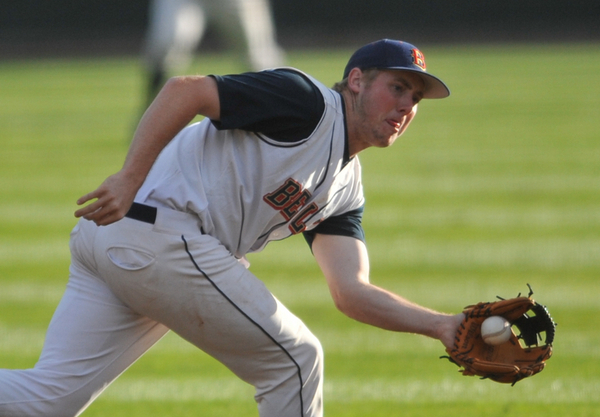 The Bellingham Bells have hired Drew George and Ben Greenslitt as assistant coaches for the 2010 West Coast League season. George and Greenslitt, who reunite after playing together at Lower Columbia College in 2005, fill a vacancy left behind by the promotion of Kevin Matthews to head coach last September. 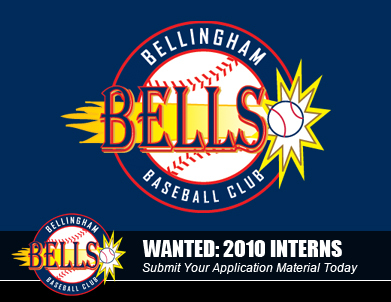 The Bellingham Bells are currently seeking interns for the 2010 season. The internship program will allow students the opportunity to gain valuable work experience within a professionally ran baseball organization. Interns will have the opportunity to work in a variety of areas including, but not limited to: ticket sales, group sales, box office operations, promotions, marketing, community relations, public relations, concessions operations, stadium operations, merchandising, and more.